１．The sales agent system was abolished in February, 2015. Shinpo provides accurate product information and ample market information directly to business owners. ２．Shinpo has direct dealings with business owners. Meetings with work supervisors and architects will be scheduled after the conclusion of a purchase agreement. ３．For all transactions, the full amount of the purchase must be paid in advance. Payment of the balance after delivery is not accepted. 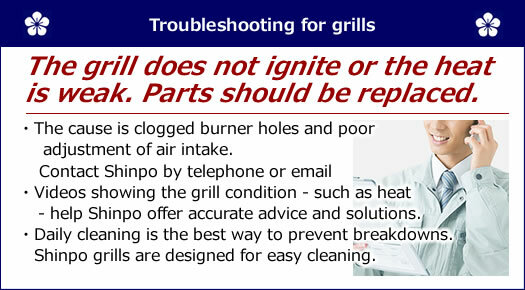 ４．Shinpo strongly recommends that business owners handle cleaning and grill maintenance on their own rather than outsourcing these tasks. ５．Shinpo aspires to build a win-win situation and a fair, long-term partnership with customers. In order for diners to enjoy Japanese BBQ free from hazards, a safe environment is essential. Since sufficient safety measures are in place, customers can use Shinpo grills free of worry. Shinpo was the first in the world to develop a smokeless grill. they are durable and generate high heat. Succssful Japanese BBQ restaurant owners and managers around the world appreciate the features of Shinpo grills. These prosperous eateries are the proof. Since its establishment in 2014, 8 brands created, and 16 shops opened. 1 person+1 person+1 person+1 person = One unbeatable team. We see the Yakiniku business as a promising and profitable way to concentrate our efforts. All you can eat American, Australian, and Japanese WAGYU starting at CAD$70 per person. Full to Capacity every day: Store 1 in a residential area and Store 2 next to the university. First Smokeless BBQ Restaurant in Oklahoma City. Word is spreading on the net! We want to make the customer’s first experience at Japan’s Gyukaku to be unforgettable, and we want to expand that service all over China. the restaurant hosts many heads of state. Starting as the president of an advertising agency, and later finding success in his dream yakiniku restaurant in Shenzhen, China. + a complement of Korean specialty dishes. the pleasure of cooking for themselves. Yakiniku restaurant in Los Angeles! "From the movement I heard about the publication of the Shanghai Edition of the Michelin Guide, we set our sights on achieving that great distinction." Planning to open 5 stores in Taipei and 20 in Taiwan as well as 24 other Cafe operations in the US. With sake barrels hanging from a six-meter high ceiling, a more than 300-seat fine dining restaurant opened in Taichung! An authentic Japanese BBQ restaurant serving Australian Wagyu beef opens in Melbourne! 'The 'One' in " Wagyu One, " the restaurant name, stands for "One and Only" - not found anywhere else. A High-end restaurant opened at a prime location in Taichung with stiff competition for the Japanese BBQ business. "Because this location is so good, I did not want to let competitors get it. I really want to succeed here." What made the president, who opened 120 outlets in ten years, purchase Shinpo grills in bulk? The largest Japanese BBQ restaurant in Sydney, opened in Chinatown on December 20th, 2015. Walter Yao (33 years old), is the youngest among four owners. He is from Fuzhou, China and studied marketing at a university in Australia. Diners enjoy stand-up meals in a casual setting with imported beef as well as crabs and lobsters fresh from a fish tank. Without the development of employees, the company would not prosper. A Yakiniku restaurant has opened in Shanghai. It executes perfectly what is expected and provides more detailed Japanese-style service. Twenty years on the Champs-Elysees: What makes Japonais popular? We have prepared the dishes meticulously with great care. .
Invigorating the world's best and brightest with Yakiniku, the dreams of an Egyptian entrepreneur will come true this summer! Mr. Michael, who speaks four languages and owns ten companies, will launch a Yakiniku business. and customers sense the enthusiam of staff. I studied basic culinary skills under a Japanese chef. I still visit him frequently to learn other techniques and create new menu items. How a couple with no experience in the Yakiniku business made their restaurant the most popular eatery in the area. The owners - Emily, 26, used to work in the cosmetics business and Roy, 38, was a barber. Great success at Umai's second restaurant with tables turned over five times a day. What is the secret? The restaurant the highest priority on meeting customer expectations. Mr. Kim took the bold step to diversify his business and opened his second restaurant specializing in Yakiniku. Opening a second restaurant would test his management skills as a young entrepreneur. in Hong Kong, a gourmand battleground. The recipe for success is a tight-knit group of five venture capitalists. They are close and respect one another. Reputation has spread by word of mouth. A promising start - table turnover is 4 times a day. He has planned to open the first Yakiniku restaurant in Sea World, a gourmet park. Bulgogi is served with wine. The new menu of a renowned restaurant won high marks. t is not easy to nurture a family business into an established brand. Mr. Rah, the 50 year-old president has realized this difficult task. This popular restaurant has a turn over of five times a day. What is the key to success? When we visited in July, 2013, the bustling restaurant was packed with diners throughout the day. Being listed in the Michelin Guide (2011 and 2013) with a "fork and knife" designation was a reward for our efforts to pursue the essence of Korean cuisine. "Restaurant with the best quality & hospitality in China" The dream of an exchange student in Japan comes true five years later. April 3, 2007--- Ms. Li began a part-time job at a Yakiniku restaurant that changed her life. 1. People are still queuing up at 9:00 pm on a Saturday night. 2. Staff enjoy the festive atmosphere, in Kanpai's own style. 3.Guests are energized from the conviviality. A packed restaurant with guests waiting in a queue is nothing unusual. Gyu-Kaku opened 6 restaurants in Hong Kong in just one year and Shinpo grills are used all of the eateries. .
Conquering The Three Major Beer Gardens in Sapporo: The reality of being "The Best in Japan"
Hokkaido has become a popular destination for Chinese due to the successful movie "If You Are the One." I went to Sapporo, capital of Hokkaido, on business in November. . Celebrities in Shanghai flock to high-class restaurants. Elegance, cleanliness, and satisfaction. Copyright (C) 2016 Shinpo Co., Ltd. All Rights Reserved.